Hi all! 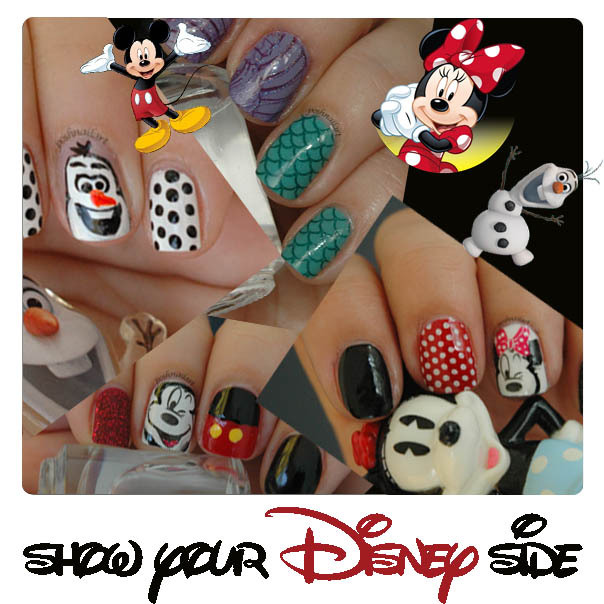 This is Aylin from Posh Nail Art and this month I’ll be showing you my Disney Side! 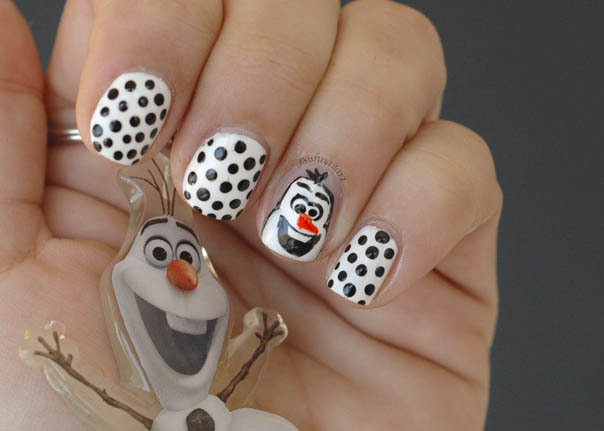 My first design is my new hero, Olaf. Frozen was a big hit and it still is, and I love all the characters in the movie, but Olaf has a special place in my heart. I started with 2 coats of white polish on my nails. Then added the black polka dots with a dotting tool. You don’t need a specail tool for this process. You can use the end of a toothpick or the head of a sewing pin! 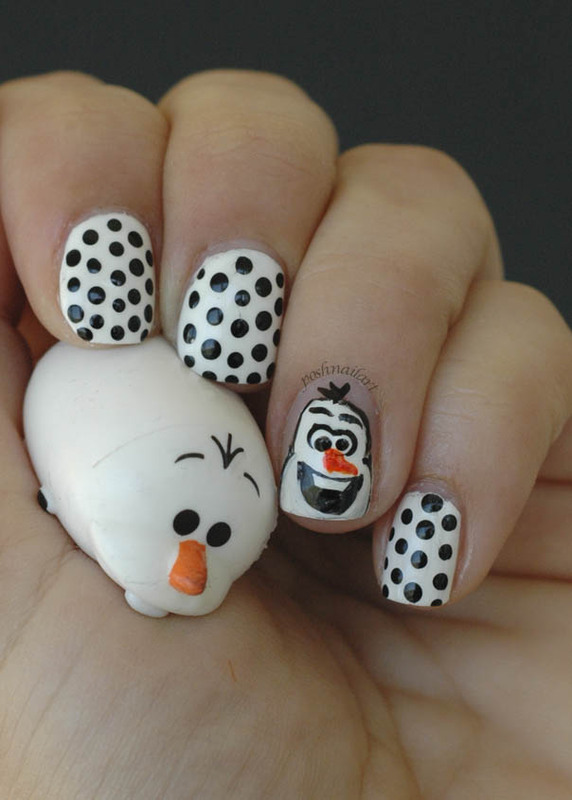 For the Olaf, I started with two blobs of white polish on my naked ring finger. When that was dry, I grabbed the thinnest brush I could find and dabbed in in to black polish and started drawing the mouth. Added two black dots for the eyes. Then two white dots over them. When they were dry, I added the pupils with black again. I drew the eyebrows, the “hair” and the teeth. I added the nose with orange and finally I outlined the whole image with black to give it a nice look. The second mani I’m going to show you is inspired by a Princess, Ariel. Index and middle finger represent her torso, while the ring finger and pinkie represent her tail. For this mani, I used stamping technique. 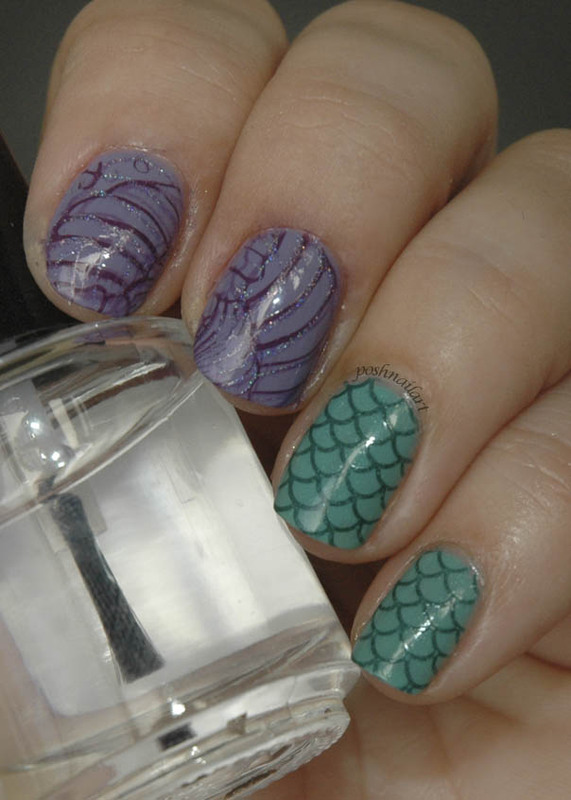 First I painted my base color and then stamped the fish scales for the tail with a holographic green polish. 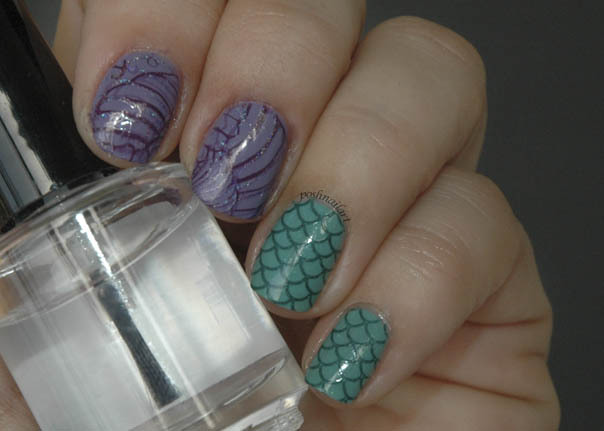 I wanted the purple part to look like her seashell bra so I picked a design that reminded me of that and stamped 3 times with different purple polishes, one light, one dark and one being a holographic again, to add some sparkles. Finished it off with a top coat, as usual. What is Disney without Mickey & Minnie? Well, it all started with a mouse, obviously, and these two will be my favorite no matter how much I grow old. 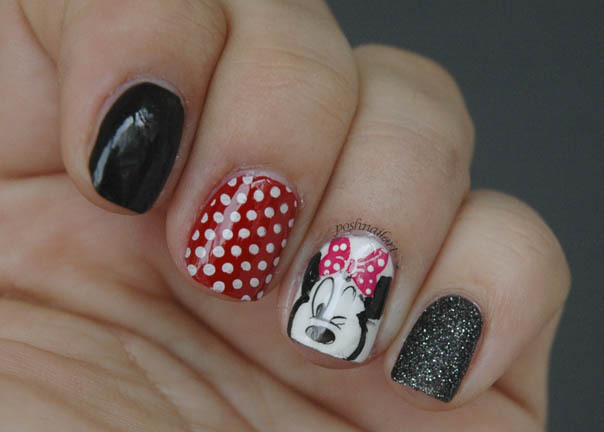 Let’s start with the Minnie mani. Index finger is two coats black, middle finger is engine red with white polka dots stamped on it. You may use dotting tools for bigger dots if you like. The ring finger starts with 2 coats of white. Then the eyes and nose is stamped with a black stamping polish. Actually, this was a Mickey image, so I just used the eyes and nose and added the bow anf filled the outline for the head with a thin nail art brush. And added some polka dots to the bow as well. And the pinkie is black textured polish, just to add some sparkle and dimension. 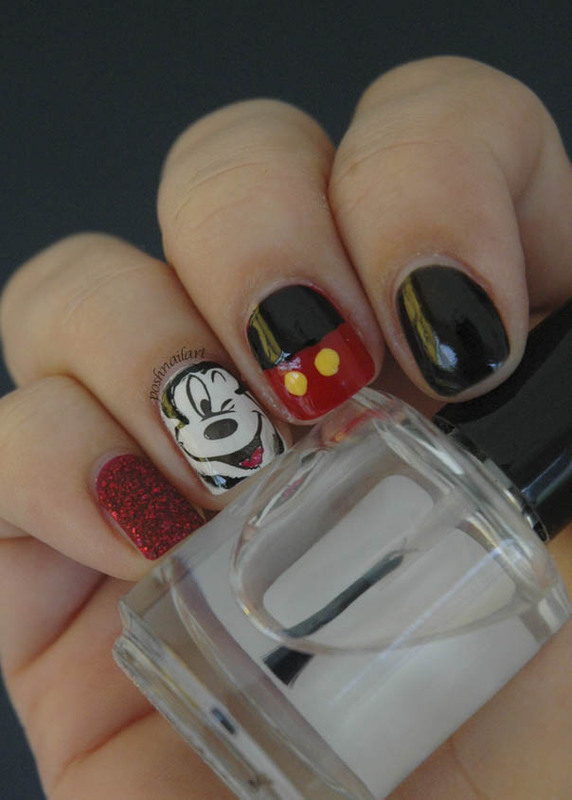 The other hand is the Mickey version! Again, black polish for the index finger, red and black for the middle finger, and I added the yellow dots with a dotting tool. 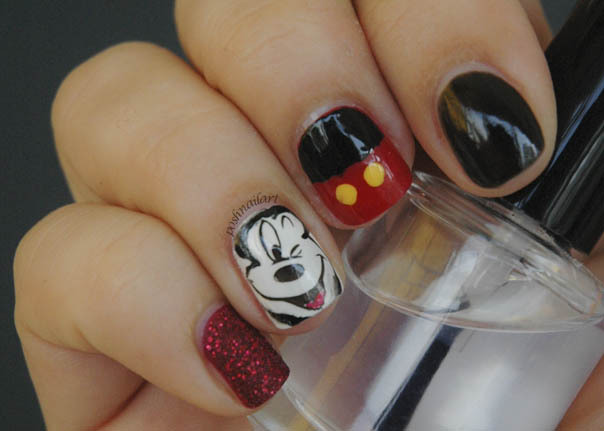 Ring finger is white with the same Mickey image stamped, this time the full image, with the mouth included. I outlined the face with a thin brush. And the pinkie is red texture polish. 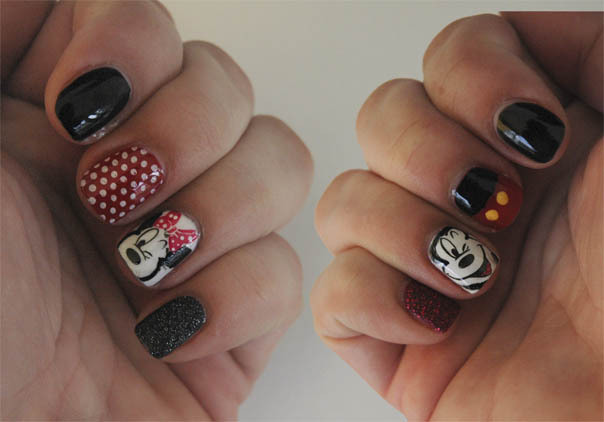 Untill then, tell us which one you liked best and visit Posh Nail Art for more fun nail ideas. 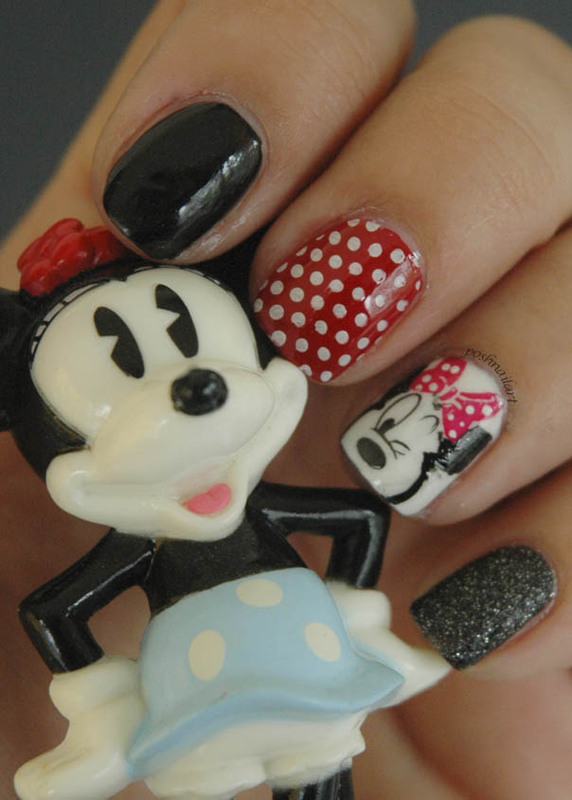 Pssst, my favorite is Minnie!! !